Fast and sharp? Insanely shallow depth of field? Sign me up! 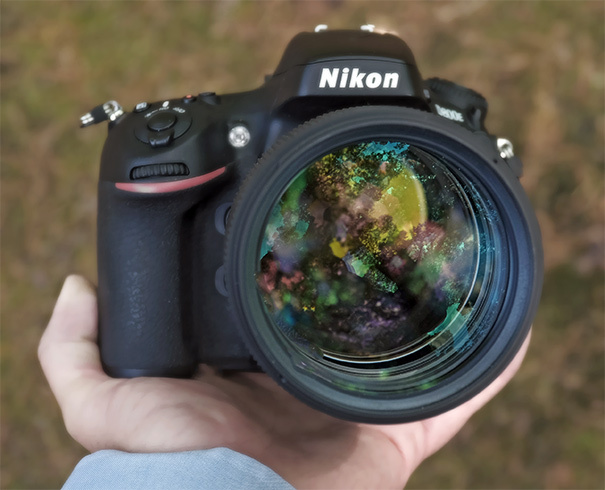 As you've likely already seen from our full technical review of this lens by our experienced senior lens reviewer Andrew Alexander, this is one of the sharpest, if not *the* sharpest, lens we've ever tested. Due to minor differences in the way lenses are tested across differing sensor sizes, it's a bit tricky making the call for the absolute sharpest, but in any case, this one rivals the best we've ever seen here in our 18+ years of lens testing. Lab results can reveal a great deal, but sample images from the real world are the other half of the story, and we always try and bring you a varied sampling of these for the most popular lens offerings. This lens is designed first and foremost with portraits in mind, so I set out with that as a primary goal, but the results produced in combination with our Nikon D800E were so enticing that I found myself pointing the lens at all manner of subjects, especially out and about in the great wide open. On the superb Nikon D800E, the autofocus performance in the field is nearly instantaneous, and the combination in tandem feels like a super-high-end instrument. I experienced no instances of AF hunting, only very fast and definitive locking onto subjects, and that includes a few lower light situations. I didn't attempt anything in super-low light though for this pass, but I still came away feeling very confident in the performance in the field altogether. The lens feels rock-solid in the hands, and the focus ring is quite wide and comfortable, with a nice textured ribbing. The two biggest drawbacks with the lens are obvious ones that you already know: It's not at all lightweight, and there is no on-board IS, but these are both par for the course for a lens of this kind. So there's weight, yes, but the comfortable and stable hold does assist in the lack of on-board IS, and in combination with a high-end full-frame camera like the D800E, this offering feels right at home. And what of the bokeh delivered from this venerable combination? I love it, but I will let the images speak for themselves. After all, bokeh is a personal thing. The nine rounded aperture blades are certainly configured to deliver the smoothest bokeh possible, and for my part as your faithful reviewer, I've tried to showcase plenty of varied image examples from different distances and locations for you. So let's dive in and get a better feel for what you can achieve with this lens out in the real world! Pupil depth: The shallow depth of field potential with this lens is almost razor-thin. At a minimum focusing distance of roughly three feet, which is about how far the D800E was from my favorite feline "Sam" in this image, the calculated depth of field using a handy DOF calculator shows the actual in-focus area to be about .2 inches, or about 5mm for the rest of the world. That's about the width of a few thick coins stacked together. Below is a zoomed in crop, not quite 1:1 as I wanted to showcase the entire area around his eye. I slightly missed nailing focus right on his eye, which is not the fault of the camera nor lens, but the point of focus is still near his eye, perhaps 2-3mm in front of it (the stray strands of hair above his eye, for instance). But what's interesting is how quickly the background and foreground blur away into oblivion. For obvious reasons then, it's important to keep in mind just how shallow you can get, as nailing critical focus on important shots requires all the mental focus and care you can muster at a tolerance of just 5mm! Isolation: The is perhaps the most revealing image in this piece, because good subject isolation is a lot harder when you're not so close to your subject. The longer reach afforded by 135mm in conjunction with the fast aperture allow for subject isolation that you simply can't get from a similar distance with traditional wildlife zooms sporting f/2.8 or smaller maximum apertures. Surrealist compression: Again, another example of a subject made much more interesting by the long focal length in combination with the shallow depth of field isolation. Interesting juxtapositions seem easier to come by with so much compression afforded from the long focal length as well. Blue Ridge Moon: This was a versatile focal length to have at my disposal as I saw the full moon descending towards the Blue Ridge Mountains. I felt lucky in that it's rare to be able to capture any lunar details with the same exposure you need for the earth and sky, but the time of day allowed for it in this instance. Interestingly, the moon disappeared behind the cloud bank less than a minute after this shot was captured, well before it got to the tree line, so I'm glad I didn't try and wait for the "perfect" shot (which so often doesn't exist). The sublime: A rose by any other name might smell as sweet, but the ones photographed by most other lenses wouldn't likely look quite like this. Dragon's lair: These Antirrhinum are commonly known in the U.S. as Snapdragons, a moniker given due to their dragon-like appearance. And they certainly make for a compelling subject on which to train your long, fast prime lenses. The impressionist: The background of this shot reminds me just a bit of Van Gogh's "Starry Night" and offers a good representation of the overall bokeh appearance delivered by the 135mm lens shot wide open. After reviewing the images obtained through this hearty expanse of glass and by such a capable full frame camera, I can most assuredly concur with Andrew's earlier testament to the Sigma 135mm f/1.8: It is, indeed, destined to become a modern classic. It is quite hefty and comes without on-board image stabilization, yes, but the image quality and the myriad shooting possibilities offered by such a fast, long, sharp lens more than make up for these obvious trade-offs -- just be extra-careful in acquiring focus while shooting wide open. 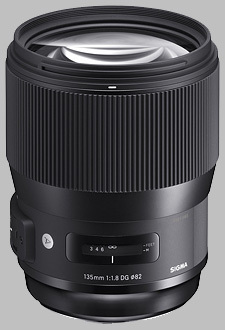 Form follows function, and the function of this new Art lens from Sigma is to deliver works of just that. See more images from this combination in our Sigma 135mm f/1.8 Gallery. Access to RAW files is also available. The 135mm prime lens is a long-time favorite of portrait photographers, combining the compression of a telephoto lens with the thin depth-of-field of a fast aperture, resulting in really blurred-out backgrounds. Sigma's release of the 135mm ƒ/1.8 DG HSM "Art" is a timely and smartly-planned lens: current offerings by Canon and Nikon in this focal length are running a bit long in the tooth, released in 1996 and 1990, respectively. The lens itself is relatively simple in design: 13 elements in 10 groups with two big FLD ("Fluorite Low Dispersion") elements and two big SLD ("Special Low Dispersion") elements. The lens accepts 82mm filters, ships with a round lens hood, and is available for US$1,399 in Sigma SA, Canon EF, Nikon F and Sony E mounts. In a word: sharp. A few more words: absolutely sharp, one of the sharpest lenses we've ever tested. Even used wide open at ƒ/1.8, on a full-frame body, the lens produced virtually no corner softness. With a lens at this level of quality, the only reason you want to stop down is to direct how much depth-of-field you want in your image; there is no need to consider the effect on sharpness. Once you stop down to ƒ/16, we do see some light softness across the entire frame due to diffraction, but then at that point, you're probably not using the lens as it was intended to be used -- wide open, every time, all the time. The Sigma 135mm ƒ/1.8 DG HSM Art lens employs two types of low-dispersion lens elements, which demonstrably reduce the impact of chromatic aberration. 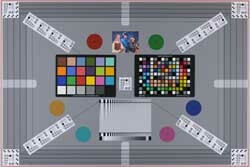 There is a light color fringing that occurs when the lens is used at its widest aperture, showing a slight fringe of purple in areas of high contrast. Otherwise, the lens is remarkable and does not show signs of longitudinal chromatic aberration, which are sometimes present in lenses featuring very wide apertures. The Sigma 135mm ƒ/1.8 shows some slight corner shading when used with its wider apertures on a full-frame camera body: at ƒ/1.8 on the D810E, we noted extreme corners that were two-thirds of a stop darker than the center. In other cases, corner shading is negligible. The lens shows relatively no distortion. The Sigma 135mm lens autofocuses very quickly, racking from closest focus to infinity in about 1 second, thanks to its electronic Hyper Sonic Motor. In basic usage, autofocus was fast, locked onto targets easily and didn't hunt while focusing. Small changes in focus happen very quickly, and the AF motor is almost silent. Attached 82mm filters won't rotate during focus operations. While the Sigma 135mm "Art" isn't designed as a macro lens, it offers surprisingly good macro performance for its class. That said, there are certainly better lenses for this purpose. The 135mm ƒ/1.8 offers 0.2x magnification, with a minimum close-focusing distance of just under three feet. The Sigma 135mm ƒ/1.8 Art lens follows other recent Sigma lenses in terms of build quality, construction and design. The lens features their characteristic sleek, matte black finish and thickly gripped zoom and focus rings. The barrel itself is constructed out of Sigma's proprietary Thermally Stable Composite material, which allows for much tighter manufacturing precision compared to standard polycarbonate plastics. The lens, therefore, feels great in the hand. The build quality is excellent and feels very solid. However, you don't get this kind of performance without some serious weight. For a prime lens, the Sigma is surprisingly heavy, tipping the scales at over 40 ounces. This is much heavier than both the Canon 135mm ƒ/2 and the Nikon 135mm ƒ/2 lenses, though for the performance, it is unquestionably worth it. The lens features nine curved diaphragm blades to make up its aperture, which produce buttery-smooth results for bokeh. The lens features two switches, the first used to activate or deactivate autofocus on the lens. The second is a focus limiter, which has three positions: 0.875m to 1.5m (a typical portrait distance: 3 to 5 feet), 1.5m to infinity, or FULL, where there is no focus limitation. A distance scale is provided with ranges indicated in feet and meters: there is no depth-of-field scale, nor is there an infrared index marker. The focusing ring on the lens is generously-sized at 1 7/8" wide, composed of rubber with a deeply ribbed texture. The ring has soft stops that let you know you have reached either end of the focusing spectrum, and autofocus results can be overridden by just turning the ring at any time. Also, employing autofocus does not turn the focusing ring, making the experience quite seamless. The lens ships with the LH880-03 round lens hood. The hood is bayonet mounted, reversing and attaching to the lens for storage. Released in the early nineties, the Nikon 135mm ƒ/2 offers its unique defocus control technology. We haven't tested this lens, but can say that it uses an older mechanical autofocus technology rather than Sigma's hypersonic motor. Canon offers two flavors of 135mm lenses: the regular ƒ/2L, and a soft-focus ƒ/2.8. The ƒ/2L lens is almost as sharp as the Sigma at wide apertures: stopped-down to ƒ/4, they are quite similar in character. The most expensive of the 135mm lenses, Sony's offering matches the Sigma for its aperture capability, but Sigma knocks the Sony out of the park with its sharpness. On a full-frame A900 the Sony 135mm has to stop down to ƒ/8 to achieve the same edge-to-edge sharpness the Sigma achieves at ƒ/2. We haven't tested the Carl Zeiss 135mm, but Zeiss lenses are renowned for their sharpness. 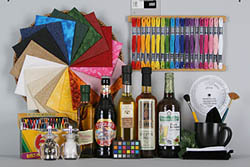 In this case however, you are also forgoing autofocus as the lens does not come equipped with it. The Sigma 135mm ƒ/1.8 DG HSM "Art" is one of the sharpest lenses we've ever tested. It's not an inexpensive lens, but for what you get -- great build quality, outstanding sharpness, little to no chromatic aberration, and almost zero distortion -- the lens is worth every penny, and destined to become a modern classic. This lens is everything reviewers say. The lack of VR/IS is a non issue with my Sony A7R3, while the extra 1/3 of a stop over my previous Nikkor 135 F2 DC is always handy. The Bokeh is the equal of the legendary Nikkor but much easier to use. But it is heavier and bigger so carrying it a long way (it weighs 2.1 KG with my A7R3 with an L plate and the hood) is an issue if you are out for the day.